You got the dreaded error: “Media Cannot Be Found,” “Media Offline,” “File Missing,” “Reconnect Media to Continue,” or some variation. It’s worded differently for each non-linear digital editor, but the meaning is the same: your media files got moved or deleted and now the editing software can’t locate them. This is a common problem that can be easily avoided if you take a few preventative measures in setting up your project. Having worked as a professional video editor for 10 years, I’ve seen all of the mistakes people make when setting up video projects and this is by far the biggest (and easiest to correct). When you’re starting out and beginning to edit your own projects, it’s easy to stay disorganized. Your source files often start out all over the place. You may have a ripped YouTube video sitting on your desktop, a project file located in your documents folder, a music track from your iTunes library, and a photo from some obscure folder, etc. One time I was brought in to finish editing a commercial for a highly respected Los Angeles television station. The project’s media was being pulled from literally 6-8 external hard drives! I would try to play through the edit and the timeline would skip and crunch. The program continually crashed, too. Moreover, the project was “tied” to this particular computer and every time they tried to transfer the project (surprise!) the accompanying media files would go missing and they got the “Missing File” error. Ugh! I couldn’t believe someone had set up the project so poorly. So the first thing I did was create a new project folder, like what I’m going to show you now. Setting up your project folder is your first step for any editing project. This is the very first thing you do every single time, before you open your editor or import a single media file. If you get into the habit now, it will save you heartache later. You can create this folder in your documents, or wherever you create projects. Make sure you have enough hard drive space to fit your entire project. These 7 subfolders will change the way you edit. Learn them. Love them. Live by them. Whenever you save your project, it’s called the ‘project file.’ This file type is not to be confused with your video files, sound files, etc. Save all your project files in a subfolder called ‘Project Files.’ Make sense? This is where you keep your original video files. Whether it’s video you shot on your phone or DSLR, or a screen recording, keep all your video content here. If you want to import video from somewhere else on your computer, first make a copy of the video file and place it into this folder. You want all of the video that your project file is going to access to to be housed here. Oftentimes, you will want to mix in other video elements into your edit. For example, you might want to show a clip that you ripped from YouTube, or incorporate a video element like a lens flare. Keeping all “non-original” media in this folder helps to keep it separated so you can find it quickly. Any special sound effects? Keep them in this folder, all together. Keep your musical tracks here. If you’re anything like me, you’ll want to try out lots of pieces of music before deciding on which one best fits your project. The music folder can fill up fast with a bunch of options, so for your own sanity, it’s best to keep it all in a single folder. Have some photos you want to incorporate into your video? Keep them here. Remember, if you’re using a photo that exists somewhere else on your computer already, you will want to make a copy of the photo and place it in this folder. Again, you never want to have your editing software reference a photo from somewhere else on your computer. All project-related photos need to live here. This folder holds all of your final exports, in most cases a finished .MP4 file. By creating this folder of finals and keeping it inside your project folder, you will always be able to find it easily. You won’t believe how many editors work super hard on a project but then when someone asks to see it, they can’t find the file! So they end up re-rendering and re-exporting the file all because they didn’t have a quick, easily-findable subfolder like this. So there you have it! A perfectly contained project folder, with completely organized subfolders! Now you will never accidentally delete a media file, or spend time hunting down a lost file to reconnect. You can easily share your entire project with all of the assets and no hassle. Plus, your machine won’t slow down (and crash!) by pulling files from external drives and all over your computer. Try this out and let me know if it works for you! And do you want to use an easier video editor and screen recorder? Try Camtasia for free today! David Patton is the Media Coordinator for TechSmith. Personal motto: "If you're at a buffet, be first and fill up your plate." Fantastic advice. I’ve been doing something similar but this structure is even better! Thank you. Great advice for a better structure of my projects. I’m a little confused because in which folder should the audio files be saved when it’s recorded separatly. Should this one be saved in the Sound folder or the Project Files folder. Great comment. One/Two folders which I would add are Audio – containing voice actors, etc. and potentially call Final Videos – Final (which could then include final .mp4s and separate .mp3s as required for some projects) or more specifically Final Videos and a separate Final Audio – a few specific use cases in mind. Love, love, LOVE this! I was a stickler for consistent file naming structure on shared drives and now I’m a professional organizer, LOL! oh gosh i have been looking for this setup for YEARS! Now that I already have projects completed…that are messier than a toddler’s bedroom…how do I deconstruct so I can take up with this standard? I only have a few so far. Is it as simple as putting the appropriate type “things” in those folders and then finding it again when Camtasia yells at me for losing the location? Thank you for the advanced learning theory…I needed this. Do your videos look kind of wobbly? 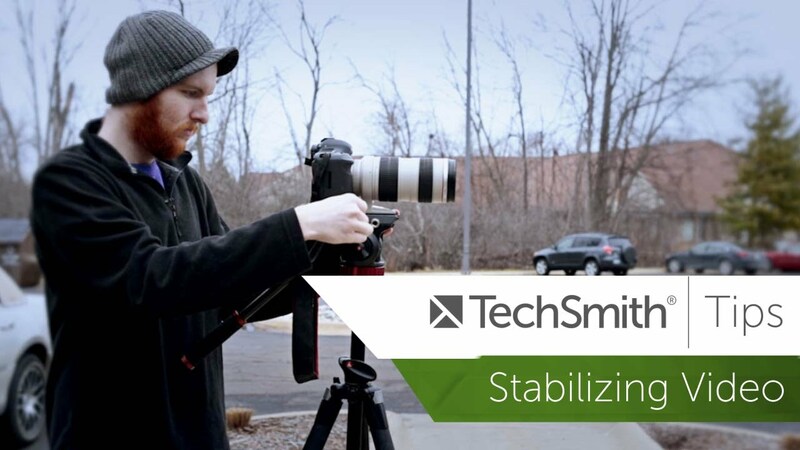 Watch as Kyle shares how you can record footage that is more clear and stable from the start, for a better finished product.